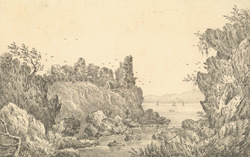 View of the ruins of Turnberry Castle in Ayrshire, Scotland. The castle is situated on a cliff, a mile from the village of Turnberry, and about 5 miles south of Culzean Castle. A fortress of the Celtic Lords of Galloway originally stood on this site and it was not until the 12th century that the stone castle was built. It was the seat of the Earls of Carrick and was the home of Robert the Bruce’s mother and probably his birth place. The castle was protected on three sides by the sea and on the forth side by a deep ditch and high curtain wall. Natural coves below the castle were incorporated into the complex so that boats carrying supplies or soldiers could sail right inside. A lighthouse now stands where the castle once was.